There are three main foundations of Public Choice theory: methodological individualism, behavioral symmetry, and “politics as exchange.” The first two are represented in nearly all work that identifies as “Public Choice,” but politics as exchange is often forgotten or de-emphasized. This paper—adapted from a lecture given on the occasion of the 30th year after Buchanan’s Nobel Prize—fleshes out Buchanan’s theory of politics as exchange, using four notions that are uniquely central to his thought: philosophical anarchism, ethical neutrality, subjectivism, and the “relatively absolute absolutes.” A central tension in Buchanan’s work is identified, in which he seems simultaneously to argue both that nearly anything agreed to by a group could be enforced within the group as a contract, and that there are certain types of rules and arrangements, generated by decentralized processes, that serve human needs better than state action. It is argued that it is a mistake to try to reconcile this tension, and that both parts of the argument are important. This paper was presented at the Mercatus/George Mason symposium “40 Years After the Nobel,” in Fairfax, VA on October 6, 2016, and again at a plenary session of the Australasian Public Choice Society meetings at the Australian National University, Canberra, Australia, December 9, 2016. The comments received after those two sessions were invaluable in extending, and in several cases correcting, portions of the paper. I wish to thank Michael Brooks, Keith Dowding, Timothy Groseclose, Jonathan Pincus, David Schmidtz, Barry Weingast, and Larry White for helpful comments. Two guides offered nearly heroic aid and suggestions: Peter Boettke and Chris Coyne, and the finished paper uses many of their suggestions verbatim without (other than herein) acknowledgement. Finally, since it goes without saying it must be said: the errors the paper still contains are no one’s fault by mine. Buchanan, J., and G. Brennan. (2001) The intellectual portrait series: A conversation with James M. Buchanan, liberty fund, Indianapolis. http://oll.libertyfund.org/titles/buchanan-the-intellectual-portrait-series-a-conversation-with-james-m-buchanan-part-1 and http://oll.libertyfund.org/titles/buchanan-the-intellectual-portrait-series-a-conversation-with-james-m-buchanan-part-2. Hume, D. (1987) Of the Original Contract. Pp. 465–487, In Essays, Moral, Political, and Literary. Eugene F. Miller, ed. 1987. Library of economics and liberty. 30 December 2016. http://www.econlib.org/library/LFBooks/Hume/hmMPL.html. Lekachman, R. (1986) A controversial Nobel choice. New York Times. October 26, http://www.nytimes.com/1986/10/26/business/business-forum-controversial-nobel-choice-turning-these-conservative-times.html. Richman, S. (2013) James Buchanan’s subjectivist economics. Foundation for Economic Education. 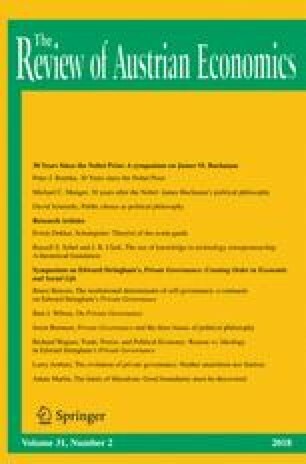 http://www.fff.org/explore-freedom/article/james-buchanans-subjectivist-economics/. Shughart, W. (2008) Public choice. Concise encyclopedia of economics, library of liberty, http://www.econlib.org/library/Enc/PublicChoice.html accessed 12/26/2016.